I made another B3 quilt - I have to keep one month ahead of my guild members. That used up 1.5 yards. 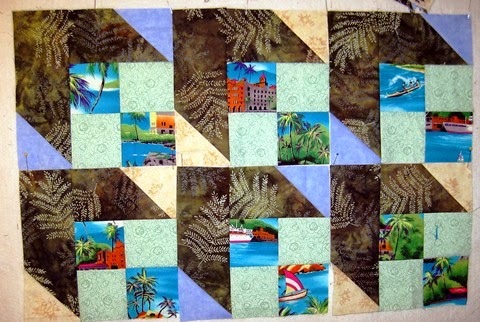 Then I made 6 blocks for a friend - that used up 1/3 yard. Then I donated 4 yards to next month's Corner Pay N Take at my guild for a grand total of 5.83 yards out of my stash. That brings my total YTD to 21.29 yards out. Not bad for the end of Week 8. Do you see the stitching at the outer 1/4" of the border. I'm having the dickens of a time trying to decide how to add the piping as the piping I chose has a large edge to it and I can't place it right. I'm thinking of hand basting it in place using the line of stitching to guide me. Any suggestions?? Not sure you can see the quilting. 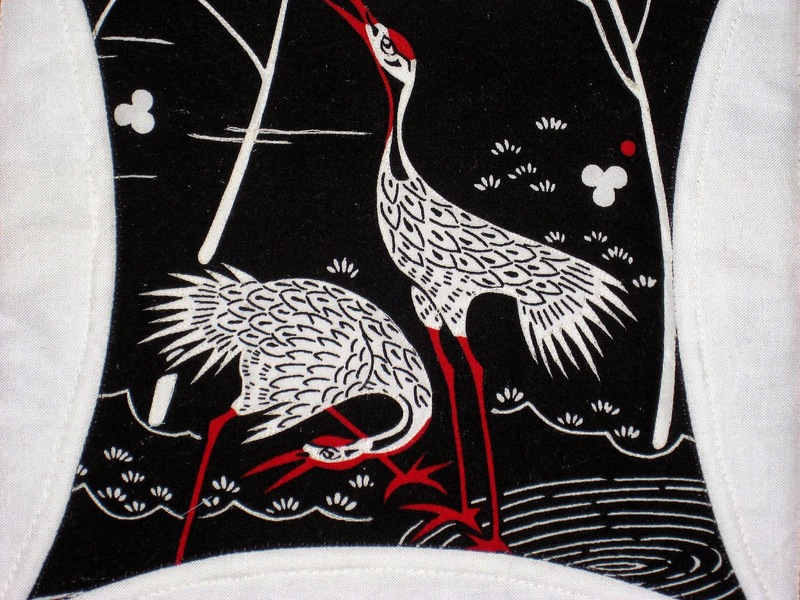 I top stitched the trees, around the inside of the cranes and the lines denoting the ground. I'm linking at Judy's Patchwork Times, Esther's WOW, and Lyn's BOMs Away. Go check them out. 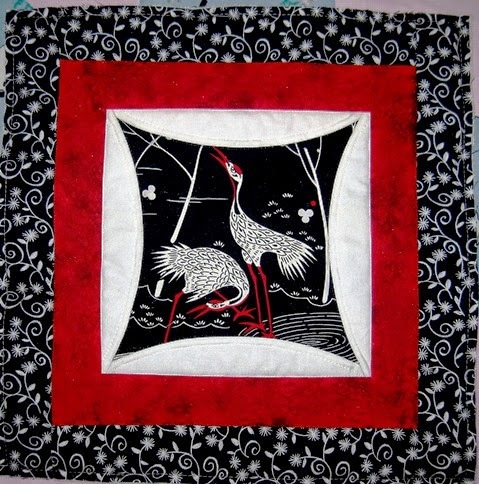 I love that crane block - I love the red, black, and white and cranes, too. :D At our summer cabin a blue heron visits us every day and he/she is a sight to behold. Your other piece is similar to the one I called 'arrowhead' and I like the idea of the 4 patch - looks very nice indeed. I am no help on the piping but I think both projects are lovely. Your number are looking very good. Your crane block is lovely. I can't see the quilting very well on my monitor so no help on the piping. Those last blocks are really unique. Do they have a name? Good numbers for the week. Beautiful projects and great stash numbers. Not a bad week. Your crane block is beautiful. The piping - is there any way to trim it's edge to the right width? I cannot even imagine how you create that piece - it is beautiufl! I love the crane bird block. And the 3-dimensional blocks are stunning!!!! The block with the crane focal point is wonderful! I would gladly add my 2 cents about the piping if I could see what iit is you are refering to. A photo maybe of the piping on the block? Pretty! My suggestion is to use a zipper foot to attach the piping. I love that foot for things like piping but it also works great for edge stitching. Good luck! This block is STUNNING. I love cranes, but this is one of the best ever. Great job!